I thought I would share a unique bit of history about Timnath Colorado. It is the little town that is located just across I-25 on Harmony Road as one leaves Fort Collins to the East. There is a lot of great new housing being built in subdivisions near Old Town Timnath. 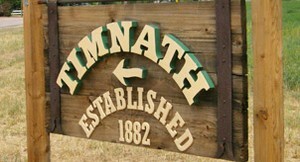 Timnath was originally a tight knit farming community centered around the Timnath Schools and the little Presbyterian Church located on Main Street. My knowledge of the town comes from my wife, Bonnie and her family who lived there for a good long time. Her Dad, Dr. Paul Bethke, was Superintendent of the Timnath School District when she was a little girl. There lived an unusual citizen in the town who was a member of my wife’s family. His name was Laddy - a mixed breed of dog that was called by my wife as an “Old Fashioned Collie.” He literally and figuratively ran the town. Every morning he would make the rounds along Main Street, visiting the local automotive garage, the butcher shop, the hardware store, etc., and finally, a little later in the day, the school, where he would hang with Dr. Bethke until the day ended. If Laddy didn’t make his rounds, the Bethke’s phone would start ringing with people asking where he was. Honorary Citizen with "Special Privileges"
He could be seen walking down Main Street, more often than not, with a great big bone in his mouth that he had picked up at the butcher shop --- he particularly loved to visit there. Well, the town was having trouble with a lot of loose and stray dogs, and in those days canines were not vaccinated for rabbies. The Timnath Town Council decided to institute a leash law to control at least the dogs owned by folks living in the town. There was a problem, however, what about Laddy? Well, after a brief discussion, the Timnath Town Council voted unanimously to exempt Laddy from of the Leash Law. He was made an Honorary Citizen with “special privileges.” I got to meet Laddy when he was a very old and you could tell he was one very special fellow. He was love incarnate and everyone who met him knew it. For more extensive information about homes and condos for sale in Timnath or real estate in other nearby cities such as Fort Collins, Loveland, Berthoud, Severance, Wellington, Windsor and nearby urban or rural Northern Colorado areas, please give me a call at 970-412-1657 or contact us here.